I realized today I have not posted a travel update in a week! For those following our trip, my apologies for not writing more regularly. Truth is, we are soaking up so much experience each day that at the end of the day my energy is sapped and I decide to put off writing until the next day…and this cycle keeps repeating. So here’s an update. We left Karpathos last Saturday and went to Athens, which has become my new favorite ‘big’ city. Loved Athens WAY more than I thought I would. We only planned to spend three days there, and after the first day realized that the short timeline was not nearly long enough to see and do as much as one could and should in Athens. It was wonderful to see ancient ruins everywhere we went, and of course the Acropolis and other ‘major’ ruins were stunning and memorable. 1. 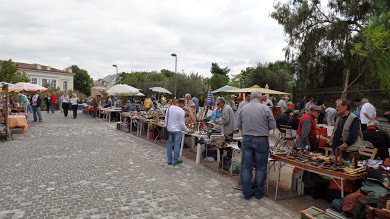 Discovering the Athens Flea Market. This was a huge swap-meet and antiques district that I spent WAY too much time wandering through, despite knowing at the onset that I was not going to buy anything. 2. Dinner at Oroscopo. I generally don’t order pasta when I go out to eat, but their freshly made tagliatelle with mushrooms, Ionian sea bass, and wine saffron sauce sounded really delicious. And it was. Seriously the best pasta dish I have ever eaten, hands down. 3. Listening to traditional a trio of musicians (including a pregnant singer) play Greek folk music at a charming taverna in the old part of town. 4. Wandering across a small church on Sunday morning and seeing a very young child receive her first communion. At least I think that was what was happening. It was a bit hard to tell given my lack of understanding of both the Greek language and Greek Orthodox rituals. 5. Watching a group of break dancers kicking serious street performer a**! They were fabulous! 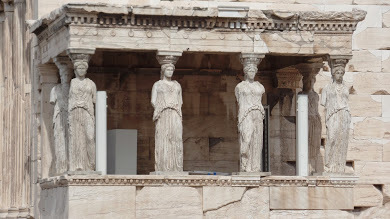 As we prepared to leave Athens on Tuesday I realized how much I wanted to stay, to keep exploring and getting savvier about commuting on the subway and learning more about the city. 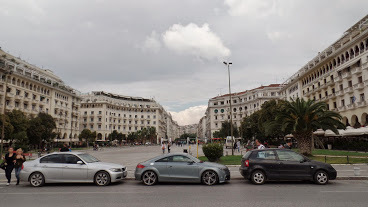 But we decided to follow through with our plan to go on to Thessaloniki, hoping this next stop would also have lots of cool things to see and do. Two days into our stay in Thessaloniki I am even more smitten with this town than I was with Athens! It’s a really beautiful place, with a waterfront that was designed in 1917 by French architect Hernest Hebrard, after a huge fire (“The Great Fire”) destroyed two thirds of the city. Under Hebrard’s vision, the city center was rebuilt to look a great deal like the Riviera, with grand hotels lining the harbor. Although many of these buildings have since been converted to offices and apartments, you can clearly tell they were at one time super lux places for travelers to stay. Thessaloniki also has lots of museums and cultural centers to explore, including the Jewish Museum of Thessaloniki. Before WWII, Thessaloniki was home to many, many Sephardic Jews, who arrived here from Spain in the 15th century. I was amazed to learn that in the 16th century, more than 1/2 the population of this city was Jewish! Go figure! 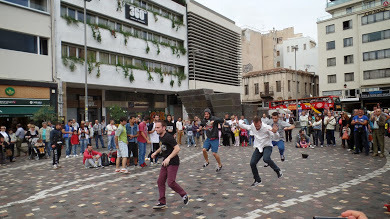 Although the Jewish population is much smaller today (96.5% of Jews in Thessaloniki were exterminated during the Holocaust), there is still a Jewish quarter of the city and a dynamic presence of Jews in the community. In addition to exploring the Jewish community in Thessaloniki, I visited the Archeological Museum, the Museum of Byzantine Culture, the Museum of Macedonian Struggle, the White Tower, and the Thessaloniki Contemporary Art Center. have also observed quite a bit of the youth-oriented culture that thrives here. Our hotel “Hotel Tourist” is located in the center of town, among what seems like a million cafes and bars, all of which become packed at night with young people. If I had to sum up Thessaloniki’s nightlife it would be: Dance music, short skirted ladies, and young bearded Greek men with excellent shoes. And cigarettes. Lots and lots and lots of cigarettes. Tomorrow we take a train to Sofia, Bulgaria. We have greatly enjoyed our time in Greece, but realize we MUST start moving north now that we have reached the half-way point in our time away. Love reading about discoveries. Sounds like you’ve found your rhythm! Ginger continues to the happiest dog in the world!